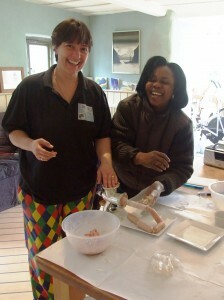 George & Ronke making a meal out of sausage making! When we had an enquiry from Nigeria about a smoking course we were delighted that news of our business had travelled so far, but unconvinced that anyone would travel from so far to see Smoky Jo here at Shap! We underestimated the dedication of Ronke and the enthusiasm of her husband Tokunbo – who continued to test our expertise by email even while we shared the finer points of slowly creating perfect smoked food with Ronke! They are both lovely people and we look forward to hearing from them when their chicken business expands to a smokery and fine catering company! In addition to doing a whole lot of smoking, we made sausages and some ribs – these we followed an American recipe for and were far too salty for our palate – but Ronke loved them. We also took her to visit our friends at Bessy Beck Smokery, and gave her a quick tour by Ullswater and Windermere. Thanks for being such a great student and easy guest at a difficult time, Ronke. And thank you for making Smoky Jo’s an international company!